Registration opens on May 5 at noon! The Forest at Duke is proud to offer a program of lectures and group discussions, arranged and presented by Summer Lifelong Learning, a group of dedicated professionals who volunteer their time and talents to provide educational summer enrichment classes for adults. These popular "lifelong learning classes" are called Summer Symposia and The World Today. Each year, the group's summer programs benefit a local nonprofit, and we are pleased to share that LIFE Skills Foundation has been selected as the beneficiary nonprofit for summer 2019. LIFE Skills is neither organizing nor presenting these summer programs, but is pleased to share this opportunity to participate! Please contact the organizers by email at tfadsummersessions@gmail.com for all questions about the programs. Due to the popularity of the Summer Lifelong Learning series, early sign-up is encouraged - seats will be limited, especially for The World Today. Registration opens on May 5 at noon. Please use the link above to register for the courses. Donations are strongly recommended but not required. We hope you will consider supporting Durham's homeless and housing insecure youth by making a donation to LIFE Skills. The suggested minimum donation is $55 per course or $90 for both, but all donations are greatly appreciated. If you prefer to register without making a donation, simply enter the promo code FREE during checkout. This course is for those interested in current events. Each week we will discuss news from around the world, across the United States, and in the Triangle. The facilitator will provide an agenda of discussion topics, and members of the class are permitted to propose additional discussion topics. Active participation is encouraged (but not mandatory), since it expands our mutual understanding of the many events that might, and do, affect us. Discussions are enriched by the variety of class members' backgrounds, expertise, and viewpoints. Topics are discussed knowledgeably, respectfully and, sometimes, with passion, but we always end with humor, looking forward to the next class. And, many of us even continue the discussions over lunch. We offer two sections of this class due to the large number of interested participants. Each facilitator is a news and political affairs junkie and has led discussions many times, and each brings his own distinctive style and background to the class and, most importantly, each will encourage a wide selection of views from class members. *This registration is limited to the first 55 registrants who are not Forest at Duke residents. The first 25 to register will be in the Crafts Room. Symposia, an invited speaker series, features a different speaker and subject each week. 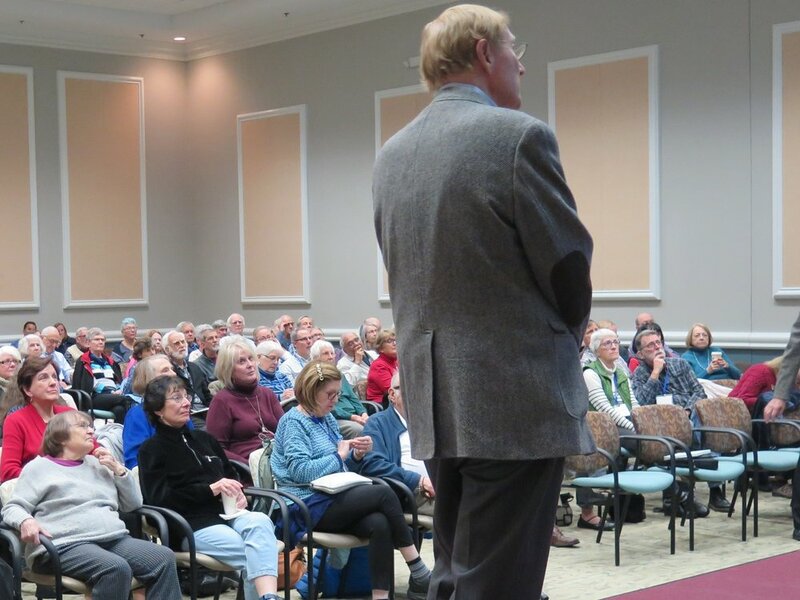 Symposia classes are on Tuesdays from 2:00 to 3:15 p.m. in the auditorium on The Forest at Duke Retirement Community campus. Here is our present agenda which is subject to change due to the busy lives of the speakers who volunteer their time. June 11- As Summer session begins we’ll learn how to become more emotionally and physically fit which, afterhearing some of the other speakers, will be a good way to start! Carol Krucoff is a yoga therapist, fitness expert and award-winning author who will show us some of the yoga techniques we can take home and use. She’s uniquely qualified for this and has been teaching yoga instructors how to safely adapt their practice to accommodate older bodies, minds, and spirits. June 18- Dr. Donna Kessler, the Research Integrity Officer for Duke Medicine embodies the message of Harry Truman’s famous quote "The Buck Stops Here." She’ll tell us about her role in making certain that Duke’s clinical research studies are conducted with the highest ethical principles and fully represent what takes place with subjects, sponsors, study teams, and final results. June 25- In his book The Faces of Poverty in North Carolina, Gene Nickol, the Boyd Tinsley Distinguished Professor of Law at UNC, writes about the scores of homeless men, women, and children who take refuge in makeshift camps, barely hidden in the woods near some of North Carolina's most affluent neighborhoods. Hundreds wait longhours in lines to receive basic health care at underfunded free clinics. In large cities and small towns, children--especially children of color--rely on meals provided at their schools to keep hunger at bay, while parents struggle in jobs that fail to pay living wages. Professor Nickol will help us see what is too often invisible, to look past partisan divides and preconceived notions, and how to seek change. Only with a full commitment as a society, he will argue, will we succeed in truly ending poverty, which he calls our greatest challenge. July 9- As the comic strip character Pogo’s statement “We have met the enemy and he is us” alludes, we are, perhaps, the single most dangerous, invasive species on the planet. Will Wilson will address one aspect of that danger caused by our gathering into more concentrated urban and suburban areas. He’ll show how the making of a city converts green spaces to hard spaces, and how that action leads to environmental changes. He will discuss air quality, stormwater, and environmental health problems in urban environments. Will Wilson earned his Ph.D. in Physics, then researched topics in theoretical ecology and evolution. Most recently he's written two books on urban environments, Constructed Climates (2011) and Stormwater (2016). July 16- Caring for someone with Alzheimer’s or a related cognitive impairment poses unique challenges and risks for well-intentioned family caregivers. What evidence-based approaches help family caregivers minimize risks to personal health, social connections and well-being while assuring the quality and effectiveness of their personalized care of a family member? Lisa P. Gwyther, MSW, LCSW, will offer us some insights. She is an associate professorof psychiatry at Duke and served on the National Institute of Medicine’s consensus panel on cognitive aging. July 23- Dr. Robert George was a professor of Marine Biology at UNC Wilmington before he retired to form the George Institue in Wake Forest. The column he wrote in the June 18th N and O briefly described a workshop among some key members of the ocean research community and we're going to hear more about their deliberations. He will be talking about the need for prudent coastal resilience and improved infrastructure to resist the inevitable storms and hurricanes. He did not quite phrase it this way, but it appears if we take the cartoon ostrich posture and keep our head in the sand, there will soon not be sand left. July 30- In Veterans of Foreign Wars Posts there’s a table reserved for guests, but it is never be occupiedbecause it’s a memorial for the United States military’s MIAs, KIAs, or POWs. Very often questions about these absent guests go unanswered. Today we’re going to be listening to a man who spent part of his military career working at finding some of the answers to the questions raised during the Vietnamese war era. We will have the honor of meeting Jack Donovan Colonel, U.S. Army (Ret) who will be telling us about his mission as the senior representative of the U.S. government in Hanoi, Vietnam in the search for our POW/MIAs. *This registration is limited to the first 120 registrants.